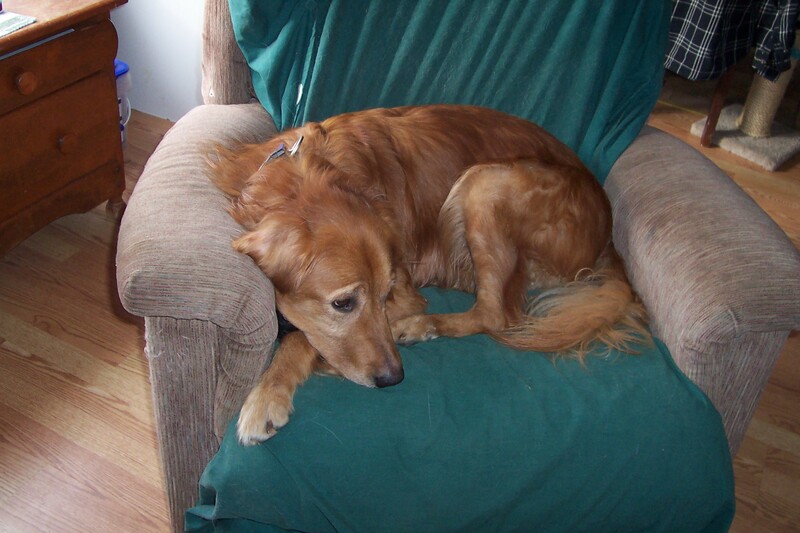 Murphy was found abandoned in Corning, NY in October, 2009. After some diligent veterinarian care the worms, fleas, mites, and matted hair were gone, and Murphy came up for adoption. A friend of mine at work is very involved in GRROWLS . Knowing we had just lost two of our four very close canine companions in September, 2009, she approached me and said she had a wonderful dog and asked if we would consider adopting Murphy. My husband and I were not looking to adopt quite so soon after losing our other two dogs, but the opportunity to rescue a fine dog could not be passed up. We said yes; and in early November, 2009, Murphy was a member of our family. Having been on his own on the streets of Corning, he developed some habits that needed to be eliminated. He is a very intelligent dog, and he has learned that his old habits are not necessary anymore. However, he also came to us with some obviously good training from his original owner, whoever he was. He comes when he is called (most of the time), and he sits up so sweetly when he wants to go for a ride or is begging for a treat. We have three cats, and Murphy and they had to come to understandings. At this point in time, all three cats rub him when he is in the room. If he is not enjoying it, he is certainly tolerating it. He has become great friends with our little Eve, a 4-year-old mixed breed. Our 11-year-old Rottweiler, Pogo, tolerates Murphy but also lets him know when he oversteps his boundaries (whether he actually has or not, you have to know Pogo). Murphy has been with us a few months now and knows we are his new people, and he has a new permanent home. He has all sorts of room to run and hunt for mice in the pastures. We have 4 horses which he will readily bark at but not approach! Murphy is a great joy in our lives. What a personality he has. He is constantly making us laugh with his antics. Thank you GRROWLS for a great job in helping to find these wonderful Golden Retrievers the homes they deserve.